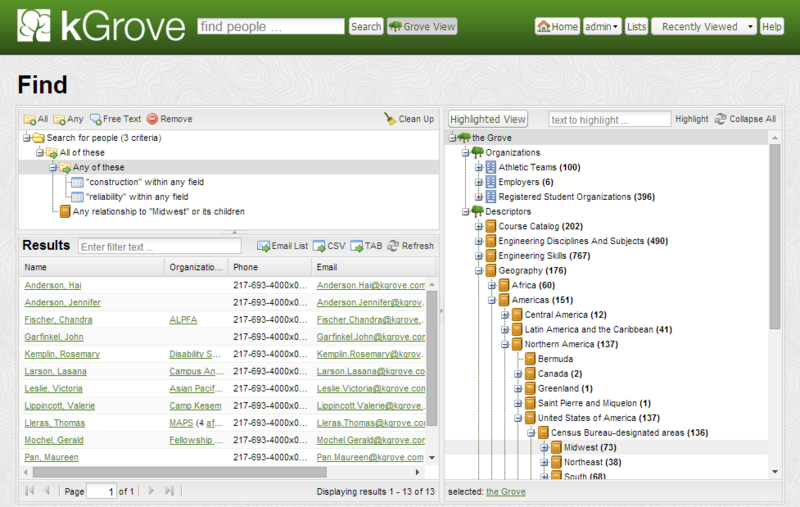 kGrove Connect is a powerful, easy-to-use webtool to help organizations capture, store, and retrieve information about people. It is completely customizable: users can define their own subject areas and descriptors, add organizational trees to reflect roles and relationships, and describe people both within and outside their organization. Controlled taxonomies provide structure to who has expertise in different areas, and the drag-and-drop search interface reduces seeking time and improves results. Corporations are only as effective as their workforce, and knowing who knows about what in an organization is critical for efficient operation. Connect can help you capture details about your company's knowledge, experience and connections to help the right people be found. Connect can also describe faculty and students at universities, letting users effortlessly search across institutions for particular skills and experience to fill positions with the best candidates. Help others find the right students or faculty at your university! Connect provides the potential for a comprehensive, powerful faculty directory that can capture your research areas, publication histories and expertise on campus. Connect also reflects organizational units and their place in the institutional hierarchy. Connect also helps students reflect their skills and interests in a structured way, so that corporations can search for the best fit for their needs using any number of desired criteria. Your students can gain insight into the corporations themselves so they can make informed decisions about their future.